Spartiatika Loukanika are the famous Spartan Sausages, which are flavoured with orange and spices. I have tried nearly all type of Greek and Cypriot sausages and not that I don’t like them all but these ones with orange flavour are my favourite. Trying to keep some traditions alive, I made bombari recently and then I got the idea of making my own sausages. Why? First and foremost I like challenging myself to see what I can make and secondly who wouldn’t like to eat some homemade sausages? I did not have a recipe nor could find one online so I called my sister-in-law, who lives in Sparta and she gave me the recipe which she, in her turn, got it from a friend of hers. No amounts as usually in most Greek recipes coming form the villages. I had to google search to find out what “throumbi” was. I found a Greek site which explained what throumbi is and gave its scientific name which is Satureia Montana, Thymbra. Searching these three words I found this in English. Reading about the herbs I decided to use thyme, savory, marjoram, and white oregano. I asked the butcher what part of the pork would be suitable for sausages and he explained that pancetta would be the best but the sausages become too fatty, so I asked him to grind some meat with less fat. You can either use pork leg or shoulder if you want lean meat. Ask your butcher to grind the meat using the big holes and just once. The addition of garlic and wine are optional, but I preferred to use them. This time I did not have much work to do as the intestines were already cleaned. After preparing the sausages, they should be hang for a couple of days in order to dry. The best way to dry them is to dry them at the fireplace. In the villages, they had a fireplace in the kitchen where they used to cook and dry their meat or sausage. However this is not possible to be done in an apartment, so I left them in a colander in the refrigerator for two days and then put them in the deep freezer. Before freezing them, I fried a couple to try them and they were delicious. I must say that they did not taste like the real Spartan Sausages but none the less they were very delicious. Years ago, before refrigerators were invented or even before electricity, can you imagine how people lived? We stuff our refrigerators with lots of products and whenever we feel like cooking we just thaw something and cook it. Back then people had hens and turkeys, rabbits and other domestic animals in their yards, which they would raise for their food. Whenever the occasion called for celebration they would slaughter a hen or a rooster and during bigger events they would slaughter a lamb for Easter or a pig for Christmas. They would breed the pig months before and on Christmas Eve they would slaughter it to feed the family, which was not just the couple and two or three children as are families nowadays, but then they used to have 6, 8, 10 or more children and they also had the grand parents living with them. However, even with big families of twenty persons a whole pig is still a lot of meat to consume in a few days, so without the refrigerator they had to think of ways to preserve it in order to feed the family during the winter. One way was by curing the meat in salt or, after cooking it they would put it in earthen jars and a thick layer of lard would seal the jar air tight. Another method would be to smoke them. They would use every piece of the pig from head to tail: Sausages, Louza or called Lountza in Cyprus, pasto or siglyno, pichti (called zalatina in Cyprus) are some of them. I hope to cook or talk about all these in the future. They made sausages using ground meat and intestines, louza (or Lountza) can be compared to prosciutto, which is pork loin cured in salt and then marinated in wine and spices and then smoked. Pasto or siglyno is smoked and cooked in red wine. It is then preserved in olive oil. They would make pichti (zalatina) using the head and feet. They would eat the meat from the head and especially the tongue and the feet were merely used to get the pectin. My mother would make zalatina often but as we did not eat meat from the head she would add some lean meat especially for us to eat and it was delicious. The head and feet would be cleaned and boiled together with vegetables, vinegar and Seville oranges. After cooking they would remove all the meat from the head and together with the vegetables would put it in earthen pots together with the liquid, which would form into a jelly because of the pectin created from the animal and from the citrus and a thick layer of lard would form on top, thus sealing it airtight. Wash the sausage casings, similar to my post for Bombari. Peel a thin layer of orange peel which finely cut into small pieces. I used the rind of half an orange. Combine thyme, marjoram, throumbi, allspice, half the salt and peppercorns in a coffee grinder and grind. Pound garlic with salt in a pestle and mortar. Place ground meat in a big bowl and mix in the spices, garlic paste, orange peel and wine and mix well. Place in a smaller bowl and cover with cling film and refrigerate for a couple of hours for flavours to combine. Fill the sausages and tie them with thread every 15 cm. Let them drain for a couple of days in the fridge. You can bake or fry them. Combine thyme, marjoram, savory, allspice, half the salt and peppercorns in a coffee grinder and grind. Fill the sausages and tie them with thread every 15 cm. Let them drain for a couple of days in the fridge. I continue to be impressed with your sausage making ability. Who amongst us doesn’t love sausage?! Interesting idea to add the orange rind. I imagine it cut some of the fat and added its own perfume to the pork’s. Yin and yang. Wow! It all sounds a little comlex but like you said very challenging also. I think they turned out really well Ivy and your explanation is fantastic. Ivy, when these Loukanika have the subtle portokali, they are wonderful and the idea of drying them in front of the fireplace sounds wonderful. As for Throumbi, my understanding is that is known as “savory”. These sausages sound delicious sis. I can just imagine them all hanging and being smoked in days gone by. Now you can take them out of the freezer as needed and have a very tasty meal with your family.With the orange peel these would be very appealing. What is throumbi? These sausages look so good. I always thought they were alot of work to make. I love the site and am huge fan — but I have object strongly on this These are Maniatika loukanika, or basically in Greece in markets/supermarkets at least they are only refereed to as Loukanika of Mani or of Kalamata – they are distinct by the inclusion of the orange peel. I also make my own sausages in Greece. 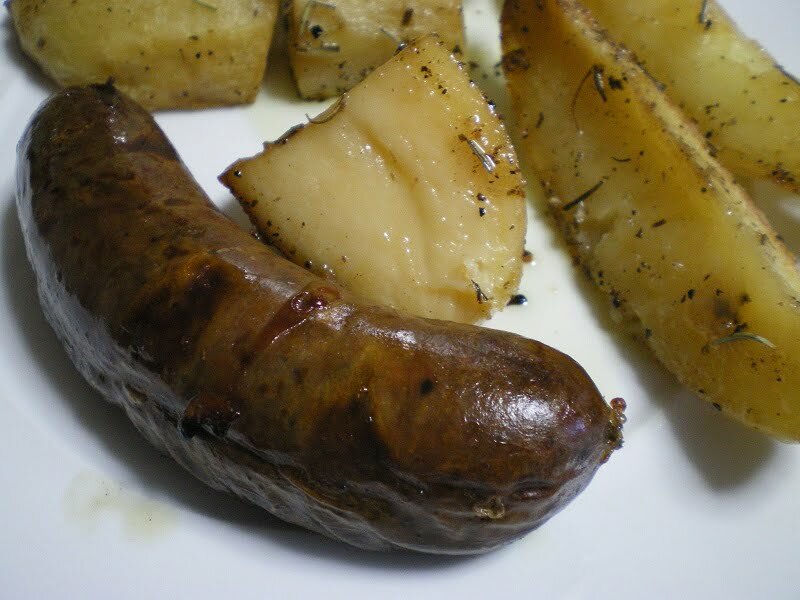 I am English and wanted to make my own sausages as the ones made locally were not to my taste (south west Crete). I started aqnd pretty soon word got round and now I have to make several batches a month for my regular customers! Which many have read and now I get e-mails from folks all over the world telling me about their sausages!! Can’t wait to try some of the best sounding recipes. Thanks for sharing!